Contrary to the erroneous impression that a paltry sum of N1.7trillion was paid as phony subsidy to a group of Nigerians for PMS consumed in year 2011, Dr. (Mrs.) Ngozi Okonjo-Iweala, the Honorable Minister of Finance and Coordinating Minister of the Nigerian Economy has corrected the public record at a Senate hearing yesterday. 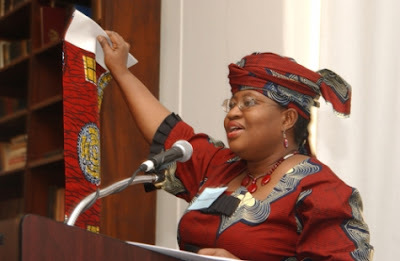 According to Dr. Okonjo-Iweala the Federal Government paid N2.19 trillion as fuel subsidy in 2011. She spoke at the resumed probe of the management of fuel subsidy by the Senate Joint Committee on Petroleum (Downstream), Appropriation and Finance. The breakdown of the subsidy payment, according to the minister, includes N1.7trillion paid as at last December and N451billion arrears paid this year making a total of N2.19 trillion for 2011 only. A curious aspect of the entire hearing however was when the distinguished Senators naively asked the erudite scholar what Nigeria is likely to pay as subsidy in 2012 in view of the minister's access to past records. Dr. Okonjo-Iweala, a Harvard trained scholar did not take offense but politely educated the Senators that "She did not know". She went a step further by transparently revealing to the Committee that she strongly believes that the Federal Government (of which she is the Coordinating Minister) must as a matter of expediency work out a formula whereby the Ministry of Finance would know exactly the amount of subsidy to be paid at any particular time. Her suggestion to the federal government (or rather her suggestion to her government) was coming 7 months after a statewide protest on the vexed issue of phony subsidy. It is on record that some innocuous Nigerians who are part-scholars and part-technology geeks identified the processes involved in the entire present fuel distribution and subsidy management scheme - and NOT JUST THE FORMULA for the amount of subsidy to be paid (shared) - as fundamentally flawed and would be willing to help the Republic institute a modern, transparent, technology enabled system that can empower the Minister, her Ministry and Nigerians with the technological and administrative enablement to pervasively monitor each drop of fuel from the high seas to the bellies of our vehicles and equipment. They knew that modern science gives them the capacity to record actual consumption for days and weeks and then project future consumption based on this with sure-fire accuracy. But what do they know? Obviously, these Nigerians read the intention of the Honorable Minister upside down. These Nigerians erroneously concluded that it is best to know the volume of what you are buying before putting your money on it! Geeks! It must of course be stated that when asked about the J.P. Morgan account that the fund of the Republic is paid into, Dr. Okonjo-Iweala honestly acknowledged that there is indeed a foreign "J. P. Morgan" account into which all the revenues of crude oil sales of the Federal Republic of Nigeria are paid by the NNPC but then she also honestly added that she does not know how NNPC operates this particular account WHEREIN all the revenues of crude oil sales of the Federal Republic of Nigeria WHENCE she serves as Coordinating Minister of the Economy are paid. Receipts from crude oil play a dominant role in Nigeria's ECONOMY and account for about 90% of her gross earnings (Odularu, 2008). The NNPC denied managing the account and claimed that the CBN does. The CBN however also denied managing the account claiming NNPC does. Again, the particular account in question is the one into which all the revenues of crude oil sales of the Federal Republic of Nigeria are paid! The essence of this note is to nudge members of the intelligent community that are fond of quoting statistics to the new reality. Instead of the wrong figure of N1.7 trillion, kindly adjust upward. The correct figure of subsidy payment for 2011 is N2.19 trillion and that is official. The intelligent community should also take note that no-one is responsible for the specific account into which all the revenues of crude oil sales of the Federal Republic of Nigeria are paid. Visit this link HERE for the relevant newspaper report on same. Olatunji is a chattered engineer affiliated with and one of the facilitators of the NDi project available HERE that offers alternative technology enabled thought processes to leadership. so an account where the country's entire crude oil earnings go into has no operator? naija is just a big joke abeg!